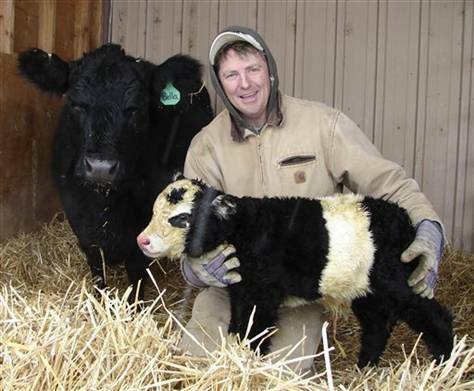 The panda cow has been genetically modified to create its special panda like markings. What truly intrigued me about the article was that these animals are bred solely to be pets. Do mini cows make good pets? Mini cows stand at a height of about 33 to 40 inches, and can weigh between 300 to 500 pounds. Compare that to a regular sized cow that can be 5 to 6 feet tall and weigh upwards of 1500 pounds for cows, more for bulls. Aparently these little guys have mellow personalities like dogs, enjoy attention, and are social. They will come when called and can be taught tricks. Another perk? Feeding mini cows is relatively cheap – if you have a good sized lawn. These guys will eat your lawn and can be kept that way so that you would not have to spend money on feed. In the winter it only costs about $30 a month to keep them fed with hay. For human consumption: mini cows can produce up to 2 gallons of milk a day – which can meet the needs of a small family for their milk requirements! Just think, no more trips to the store to get milk, you can just go to your backyard! Downsides: Mini cows are not indoor pets! They are not like dogs and cats in that regard. They need a bit of space, weigh a lot, and might not be able to be house trained. They can also be rare to find. Specially marked animals, like the above mentioned panda cow can cost around $30,000. This does not mean to say they are impossible to find or are always near that expensive, but it might take some research to find the animal you want. 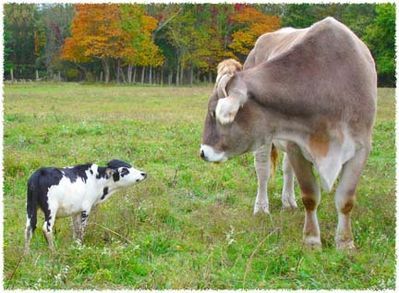 There are a number of different breeds of miniature cow, and they are used for different purposes. 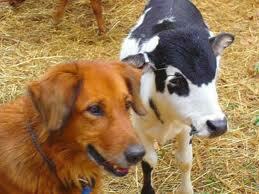 Some are best as pets, and other people actually raise them as farm animals which they use for milk and meat. It is a way to make sure that your animals are raised in good conditions and completely organically – especially if you do not have the room for fully sized cows. Miniature cattle are not genetically modified ( as in transgenics such as splicing fish genes into a tomato ). They are selectively bred for desireable traits, either by man, or by nature (large cattle are only a recent industrial agriculture phenomenon in terms of history). Small breeds such as Scottish Highland and Irish Dexter cattle were formed primarily by natural selection because of their ability to survive harsh conditions due to their ancient survival genes (people who depended on them for survival would not have culled animals just to get smaller cows, but nature is harsh, and only the fit survived to pass on their genes – and smaller cattle that do not require as much feed in the winter have an advantage over larger cattle without industrial agriculture methods feeding them things nature would not provide normally). Selective breeding has been done for centuries prior to what is done today with geneticallhy modified organisms (GMOs). For example, organic standards do not allow GMOs, but you can be a completely organic miniature cattle operation. The corporations who are desperately fighting to prevent consumers from having GMOs labeled in food pay marketing specialists and social media specialists big bucks to convince the public that GMOs are nothing new, and splicing genes in the lab (even across species barriers) is substantially equivalent to selective breeding that took place for centuries. It is simply not true, however, and we should be careful not to use terms such as referring to miniature cattle as genetically modified unless we intend to confuse. There are already plenty of folks getting paid for intentionallyl trying to confuse the issuses around transgenics such as the proponents of GMOs without labeling so we don’t have the right to know what is in our food.